Traxxas Monster Jam – Monster Mutt Review « Big Squid RC – RC Car and Truck News, Reviews, Videos, and More! When Traxxas announced the Monster Jam Replicas, there were quite a few reactions around the office. I remember telling Cubby that I was going to be driving a monster truck with ears! Cubby just rolled his eyes, and gave me the usual face palm and disapproving head shake. Fine! See if you get to play with the new puppy when it arrives! A few weeks later, we had the Monster Mutt in the office and it was time for testing! Did it win over Cubby’s approval, or has he banished it to the dog house? Keep reading to find out. So out of the box there were a few things we noticed right away. The detail on the truck is pretty good. The paint is done very well, and I had a hard time finding a place to put a BSRC sticker where I wouldn’t end up taking away from the body. The floppy ears are fun, and well attached. We haven’t lost one yet, and they are hilarious to watch wave in the wind as it’s cruising down the track or down the street. The tongue is made up of a stiff plastic/cardboard type material, and this has been acceptable so far. Something I noticed though was the lack of a tail. My first reaction was ‘well that’s ok.. because if this thing wheelies it will be torn off in no time, plus nobody will probably notice.’ Boy was I wrong, 9 out of 10 people that see the truck for the first time ask ‘where’s the tail?’. I honestly didn’t think it would be a big deal, and in the grand scheme of things it isn’t, but people really notice it, or the lack there of. Maybe a tail-wheelie-bar mod needs to happen! I’ll have to get Wrench on that. All the Monster Jam Replicas are based on the Traxxas Stampede platform with some tiny modifications. The Grave Digger has a black chassis with several molded green parts, all the trucks have wheels/tires that give them a more scale look than the stock Stampede, and with the exception of the Grinder, I think all the bodies look like they belong on the vehicle. The wheel wells are cut in good locations, and over all they have a nice scale look! All the Monster Jam vehicles come RTR with battery so you will be up and running in no time. Also, they are all waterproof out of the box, so rain, puddles, and snow bashing can all be done without worrying about frying any electronics. The Monster Mutt comes with a Traxxas AM radio which I have to say seems a little ‘behind the times’. While we understand that Traxxas is doing everything they can to keep the cost down to get these into the general public’s hands, I have to believe the cost of their 2.4GHz radio has come down considerably with them shipping with most other Traxxas vehicles. Speaking of cost savings, the tires come without foam, and the front tires are not glued. This isn’t a big deal for your average basher or newbie to the hobby, but we wanted to point it out. The lack of foam in the tires makes landings a little squishy/bouncy but probably takes some of the strain off the shocks making it overall a little more durable. We tried hard to pop the front tires off during driving, but never had a problem. If you were to upgrade to a Velineon system, you could bet these things would be flying off the rims. 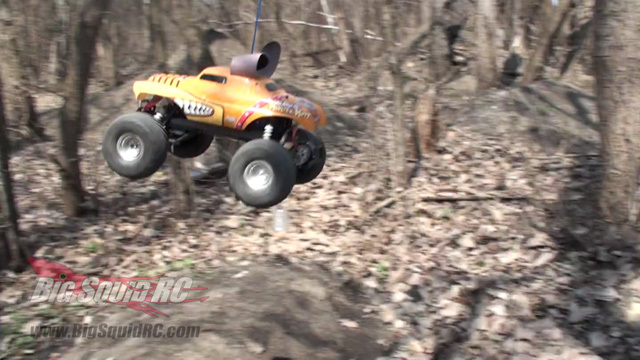 The Stampede platform has proven itself to be a great intro truck to RC, and our Monster Mutt was no different. We have been beating on the truck at the local bash spots, parking lots, track, and haven’t had a problem yet. Crazy jumps, demolition derby’s, it has survived them all with flying colors. The truck is fast enough, and powerful enough to wheelie without issue, I recommend a wheelie bar, or you’ll be ripping up that rear motor protector soon, plus wheelies are FUN! At our local bash spot it’s been a blast jumping the huge 6 foot dirt hills, driving through the mud, and tumbling/smashing on and over everything we see. A feature that I have not really appreciated until now is the ability to put the Traxxas speed control into beginner mode! With the Monster Mutt at the bashes, small kids are naturally attracted to the vehicle. Being able to put slow the truck down for them without having to worry to much as they learn the controls was great! 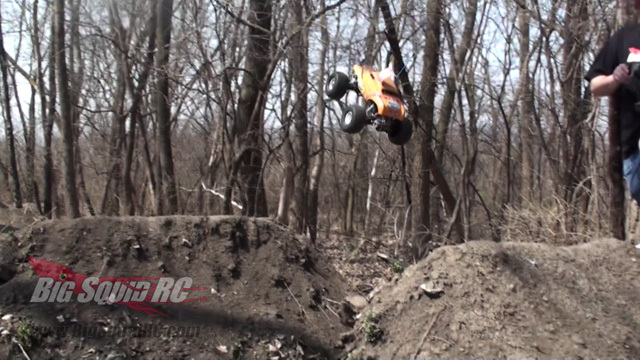 I know Traxxas has this mode on tons of other vehicles we have tested, but never have I actually had to use it so much! 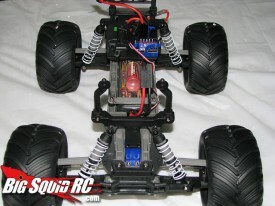 Great job on this Traxxas, anything that makes it easier on the beginners is a huge plus! While some will say it’s hard to justify the extra cost (about $25) of the Monster Jam Replicas, I think the scale look of the vehicles will help bring a lot of new people into the hobby. Any time a company can help bring people into the hobby, it’s a huge win for everyone! 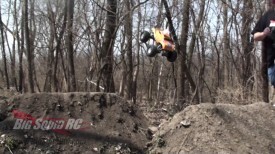 While the truck has been fun, and we know that the audience this is aimed for are the younger basher or newbie crowd, we have to admit as experienced bashers we want to see this done on other Traxxas Platforms. Why, when you have so many great 4wd platforms would you limit these to the 2wd Stampede? At the least, I would expect a version on a 4×4 Stampede but at the most, why the heck can’t I have bigger versions? Where is my Monster Mutt T-Maxx option? Seriously, why limit such a great license and scale look to the standard Stampede? Hopefully Traxxas will be making extra bodies available soon as well. We have not seen any yet for sale anywhere, but soon our puppy’s lid is going to need a replacing, and I’d also like the option of putting some of these cool bodies on a 4×4. Overall, we really dig the Monster Jam Replicas. They are built on a solid and durable platform that has tons of upgrades available to it. The Monster Mutt looks great and turns heads like you wouldn’t believe, and after weeks of bashing, no major damage can be reported. The new people these trucks will bring to the hobby are also a huge plus! As with all of our stuff, if you see us at a bash, stop by and check out the vehicles we have with us. We may let you take a test drive, and at the very least get you some stickers! 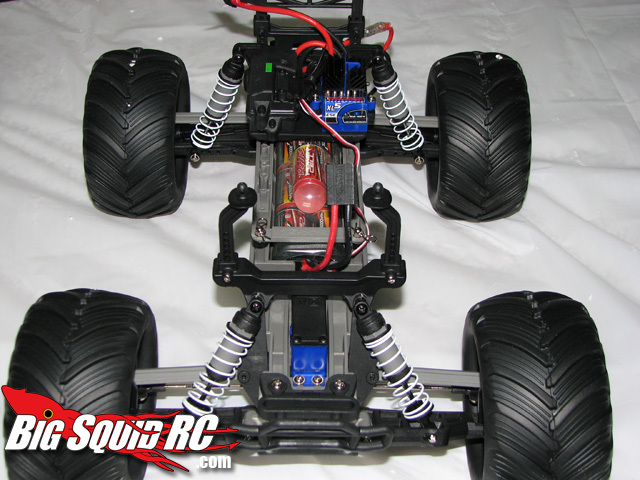 Time To Bash – 9.0/10 – Charge batteries and go! You will be up and bashing in no time! Workability – 9.0/10 – The Stampede platform is easy to work on, and has a long line of hop-ups. Car Show Rating – 10/10 -My monster truck has floppy ears and a tongue! Bash-A-Bility – 9.5/10 – It’s waterproof, durable, and fun. Big Squid Rating – 9.0/10 – Tentacles.. It’s a great truck, the extra cash might be hard to justify, but it will bring a smile to you or your kids face for sure! 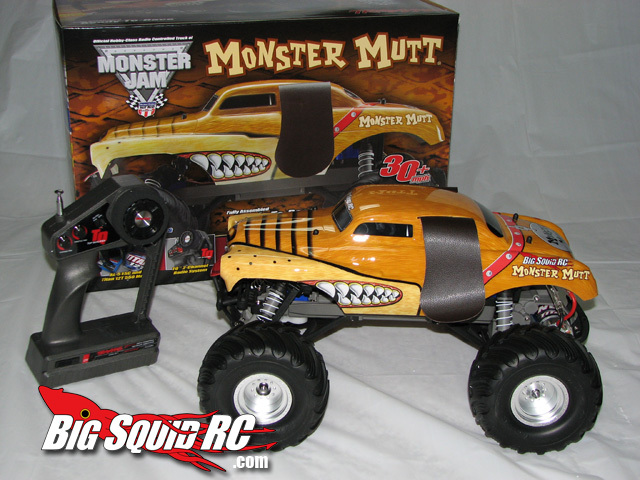 If you need more pictures, check out our Monster Mutt unboxing photos.